A Class C RV is often referred to as a mini motorhome. They also are self contained and have many amenities to offer. These cab over motorhomes range from 20 to 37 feet long. With sleeping room for 6 to 8 people, the extra room over the cab serves as a bed. It is conveniently located to give you extra room inside without taking up more space for sleeping. This is a popular type of motorhome. A lot of fulltime campers have this type of motorhome due to the efficient size and functionality. A Class C RV is also self contained. The generator runs the features that are available for your own picking. Along with the Class A features, you can find most of these available for all three types. This motorhome, being driven as a vehicle, also requires maintenance and upkeep. Regular oil changes and engine repairs will need to be done from time to time. Keep a check on the air filter. Check the transmission fluid. Do all the maintenance to your motorhome as you would your normal driving vehicle. They are the same as far as upkeep goes. You will need to keep a check on the tires and the brakes, also. All three types of motorhomes have a different level of features. 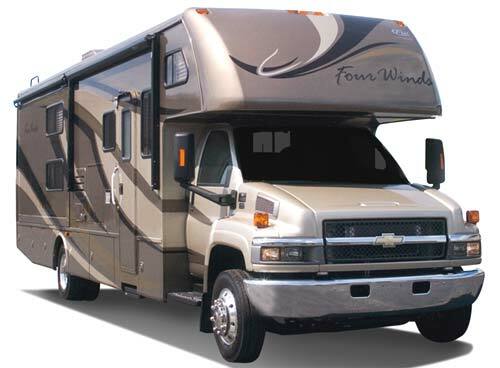 According to what you decide you need in a motorhome is how the price is allotted. This motorhome ranges in price from $50,000 to $150,000. A small vehicle can also be towed behind this motorhome. The storage on the outside of a Class C RV is very limited, so plan on inside storage when considering a purchase of one. One great feature of any motorhome is the one piece chassis that does not need any towing equipment. It is also easier to back into a parking spot at your favorite campground. One drawback to a motorhome - you have to have additional transportation if you plan to leave the camp site for anything. If you don't have additional transportation, such as a pull behind vehicle, you will find you have to pack up your camper and leave the camping spot in order to get anywhere. If you decide to get one of these motorhomes, the best option for getting around would be a dinghy. That is a vehicle pulled behind the motorhome. This towed vehicle will need to be small and lightweight so as to not put a strain on the transmission of the motorhome. You will see a drop in gas milage when towing a dinghy, but you will be glad to have a get around vehicle when you get to your destination. Easy to drive, similar to a large moving truck. The RV consumer Group generally considers the Class C a safer motor home than the Class A because of the cockpit construction. Can tow vehicle behind or support a carrying platform on hitch. Smaller windshield and curtain separating cockpit makes unit easier to heat and cool than a Class A. Largest models can be difficult to maneuver in tight spaces. Some models may be too large to drive around town; alternate local transportation may be required. Requires large storage area when not in use. Even the largest models may not satisfy the fulltimers' need for space.